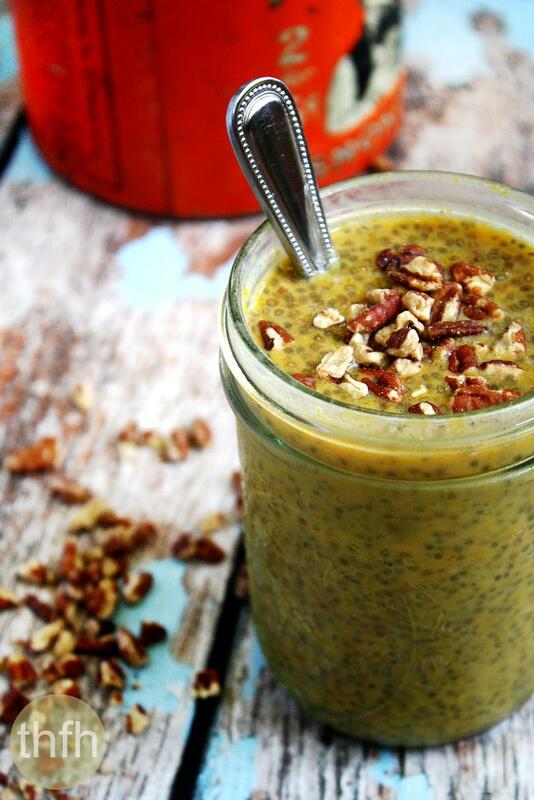 This Pumpkin Spice and Pecan Chia Pudding is an extension of my love of chia pudding…and of course, pumpkin! Chia pudding, which is basically chia seeds, non-dairy milk and your favorite fruit or other ingredients is a really easy and simple recipe to make that’s perfect for a quick breakfast or snack. I like to make mine with homemade almond milk and have made many different varieties like Vanilla Bean and Blueberry Chia Pudding, Pineapple Protein Chia Seed Pudding, Raspberry and Banana Chia Pudding and Blackberry Pomegranate and Hemp Protein Chia Pudding. I also keep it simple by using a mason jar to mix, shake and serve it in. This is not an overly sweet recipe, but you can always adjust the sweetener to your preference. It’s “almost raw” (pumpkin puree), vegan, gluten-free, dairy-free, paleo-friendly and contains no refined sugar. Want more healthy dessert recipes? Check out Crunchy Raw Protein Balls, Healthy Peanut Butter Cups, Cashew Butter Banana Sushi or my Clean Eating eCookbook with an entire chapter of 20 healthy, clean eating recipes just like this one that you will love! To order the highest quality, organic spices (including the Pumpkin Pie Spice used in this recipe) from Primal Palate, click here. Step 1 Add all ingredients to a 16 ounce mason jar and seal the lid tightly. Shake vigorously until all ingredients are well combined. Open the top and adjust the sweetener and/or spices to your preference. Seal the top again tightly, and shake again. Leave in the refrigerator for approximately 1 hour, or until it firms a little. Optional: Sprinkle additional pecans on top before serving. 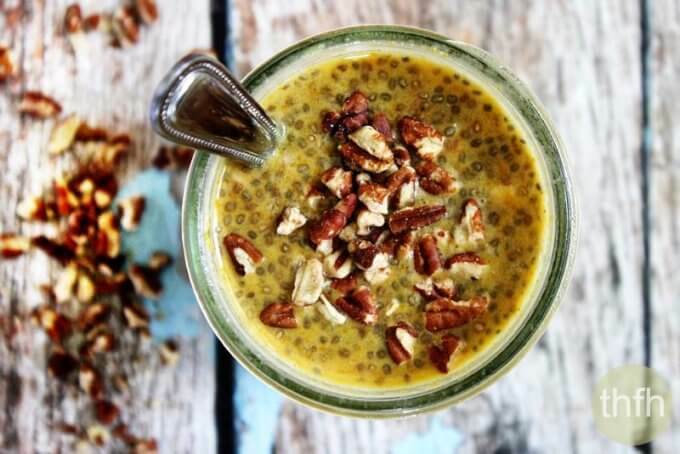 The recipe and photographs for "Pumpkin Spice and Pecan Chia Pudding" by The Healthy Family and Home are licensed under a Creative Commons Attribution-NonCommercial 4.0 International License and cannot be used without my written permission. I have just started putting Chia and coconut flakes in my green smoothie. Also changed over to rice malt syrup (no fructose). Hope you get to try it.